Peter Wilcox wrote: Sorry for the detour, Steve. No problem, Peter - I've been thinking about how I was going to saw and rout the headstock, and Freeman's reply makes a good argument for the scarf joint under the FB. Shaping the headstock is much easier before gluing to the shaft. Yes and no. Remember what I said about doing as many operations as possible with squared sides? While the whole assembly is 3 inches wide you can easily route the t/r channel and make most of the cuts on the tenon. You can cut the back of the neck to rough thickness by laying it on its side in your band saw. The minute you add wings to the head or start making a bunch of angle cuts you can't do any more of this. You'll notice that when I do the slotted head the outside edges are still parallel until its glued on. And think seriously about how you are going to hold that scarf joint while you glue it. I promise that you will learn some very basic physics - just how effective a 16 degree wedge really is. This could be a whole thread in itself. Freeman Keller wrote: Remember what I said about doing as many operations as possible with squared sides? While the whole assembly is 3 inches wide you can easily route the t/r channel and make most of the cuts on the tenon. 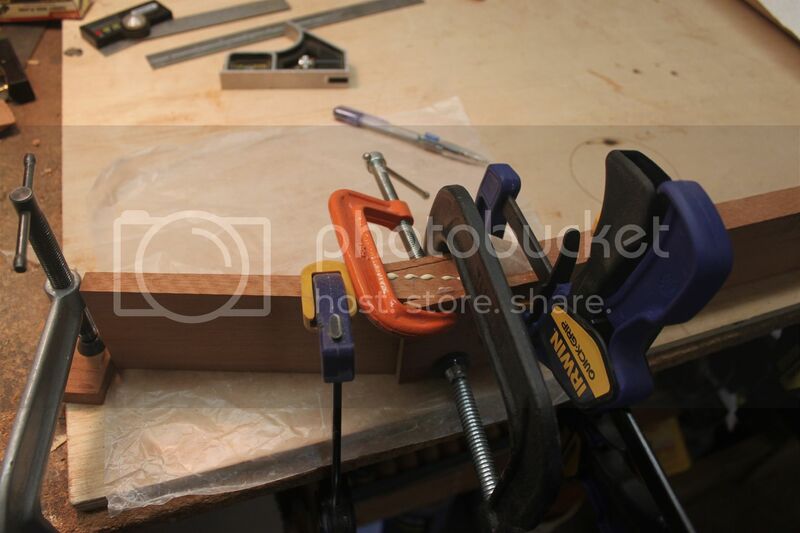 You can cut the back of the neck to rough thickness by laying it on its side in your band saw. The minute you add wings to the head or start making a bunch of angle cuts you can't do any more of this. You'll notice that when I do the slotted head the outside edges are still parallel until its glued on. Heh, heh - yeah - I realized that about three hours after I posted it. Duh!! I've done scarf joints before (not on a guitar) and used 23 ga pins and cauls to secure while clamping, but I'll take a look at those links too. Thanks! 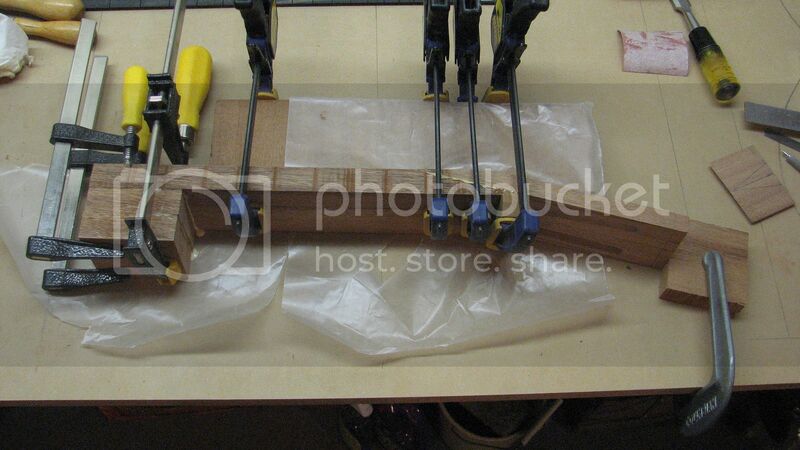 Freeman, in your pic of the glue up of the scarf joint, what keeps the neck from drifting in the heel direction? Is it that blue clamp behind the heel, clamping the neck to the long board that the scarf is clamped to? I've always used the Cumpiano set up with a stop block clamped at each end. I must have had my hands full and forgot to take pictures. But yes, either it needs a stop block at the heel or the shaft needs to be clamped to the work bench. Back to the original topic, I'm making a flat top solid body with a Bigsby type trem and a roller bridge. I've made a Fender type bolt on neck, and routed the neck pocket for the neck angle. That angle is readily apparent due to the contrast between the body color and fretboard color. I could leave it like this, though I dislike it, or gently angle the body at the side of the pocket to match the neck angle. Any thoughts or suggestions? I dunno, Peter. I'm not sure that I'd do anything with it. In the pic there doesn't seem to be much contrast between the neck and body woods, so my guess is that this is one of those things that only the builder would be concerned about. If the FB weren't already glued on, you could rout a ledge in the neck under the FB edge, making it appear to be floating over the body while concealing the wedge-shaped neck edge. I've been sidetracked into completing a large furniture project that is blessedly nearing completion, but I've had thoughts of doing this with mine rather than shaping wedges to go under the FB edges. That doesn't bother me at all. It looks like a lot of other guitars out there. By the way, Peter - that FB is a beautiful piece of wood. Rosewood or something else? Steve and Barry, thanks for the replies. I just think it looks kind of wonky, but anything I do to change it will probably also look a little weird, so I'll probably leave it as is. Steve, that is cocobolo, a wood that certainly has a nice color and figure. I find for me it will take some learning to work it, since though it seems quite dense, it is also very soft and oily, and gums up sandpaper. Being extremely lazy, I haven't made a router jig or used a plane to radius this fret board - I used the jointer to rough it out, being careful not to overdo it, then sanded.